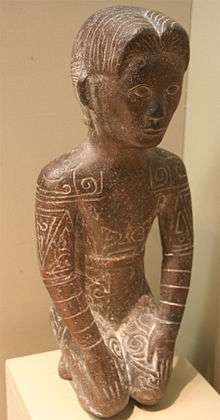 Yue (Chinese: 越; Old Chinese: *[ɢ]ʷat), also known as Yuyue, was a state in ancient China which existed during the first millennium BC – the Spring and Autumn and Warring States periods of China's Zhou dynasty – in the modern provinces of Zhejiang, Shanghai, and Jiangsu. Its original capital was a site near Mount Kuaiji (around modern Shaoxing); after its conquest of Wu, the Kings of Yue moved their court north to the city of Wu (modern Suzhou). According to Sima Qian, Yue's rulers claimed to be descended from the Xia emperor Yu. The name "Yue" was applied indiscriminately to many southern Chinese peoples throughout classical Chinese texts. A specific kingdom under their name in modern Zhejiang is not mentioned until it began a series of wars against its northern neighbor Wu in the late 6th century BC. With help from Wu's enemy Chu, Yue was able to be victorious after several decades of conflict. King Goujian destroyed and annexed Wu in 473 BC. Competing against the fewer, more powerful Warring States, Yue did not fare as well. During the reign of Wujiang (無彊), six generations after Goujian, Yue was destroyed and annexed by Chu in 334 BC. Their ancestral name is rendered variously as either Si (姒) or Yu (芋). ↑ Goodenough, Ward Hunt (1996). Prehistoric Settlement of the Pacific, Volume 86, Part 5. American philosophical society. p. 48. ISBN 9780871698650. ↑ Theobald, Ulrich. China Knowledge. "Chinese History – Yue 越 (Zhou period feudal state)". 2000. Accessed 5 December 2013. ↑ Allen, Richard. "Star Names – Their Lore and Meaning: Aquila".